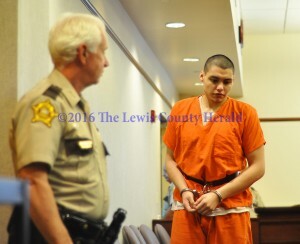 The plea came Thursday, January 28, during Garcia’s appearance in Lewis Circuit Court. Garcia waived a separate sentencing hearing and was sentenced to 25 years in prison. He must serve 20 years of that sentence before being eligible for parole. Garcia was arrested on February 2, 2014, after authorities received a call to respond to Reed’s home on Meadowbrook Drive east of Vanceburg, according to Sheriff Johnny Bivens. When deputies arrived at the home they found Reed, 46, in his living room. He had been stabbed multiple times and was pronounced dead at the scene by Coroner Tony Gaydos, according to Bivens. Bivens said Garcia confessed at the scene and had told officers he had been visiting Reed when a verbal disagreement broke out between the two men. The altercation eventually turned physical. Garcia was initially scheduled for trial on September 21, 2015, but due to a conflict of interest with witnesses who would be called to testify, Garcia’s attorney had to remove himself from the case. A trial date of June 13 had been scheduled during a November pretrial hearing. Circuit Judge Robert Conley said he expected the trial would have taken two weeks.